Debate has long been an essential part of American politics. 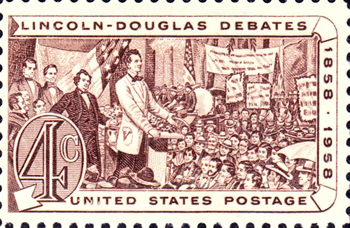 In 1858, Abraham Lincoln and Stephen Douglas participated in a series of 7 debates in which one candidate spoke for 60 minutes, the other for 90 minutes, and the first speaker concluded the debate with a 30-minute rejoinder. The media coverage of these Lincoln-Douglas debates was just as intense then as the coverage of our current presidential debates is now – and many believe those debates set the stage for Abraham Lincoln's eventual presidential election. While the format for political debates has changed over the years, the importance of the debates to a functioning American democracy has not. Far from being a platform to repackage campaign stump speeches, these presidential debates offer the American public a rare opportunity to see exactly how each candidate handles pressure, processes information, and makes decisions. The importance of the debates is heightened because the vast majority of the candidates’ proposed policies will never be enacted as originally envisioned. The reality is that the primary role of the president is to serve as a national crisis manager: The president must be ready to respond to a myriad of domestic and international crises at a moment’s notice. And so these debates provide a limited, yet useful, lens through which we can garner some understanding of how the candidates will respond to this ever-changing political landscape. The first debate on October 3 in Denver was clearly a successful performance for Governor Romney. He effectively dismantled the caricature that he is a modern day “Rich Uncle Pennybags” who is too far removed from the problems of the middle class to govern in a way that accounts for the interests of the middle class. He was engaged and passionate. Romney’s move towards the center on a range of issues from health care to banking regulations was a brilliant rhetorical choice. It undermined many of the arguments that he is an extreme ideologue, and it signaled that a Romney administration would govern with a center-right coalition as he did as governor of Massachusetts. On the other hand, President Obama’s first debate performance was underwhelming. The debate format does not seem to lend itself to his communication strengths. While the presidential debates require quick and decisive responses with very little processing time, the president takes a far more cautious approach to decision making and governing. President Obama seems to be much more comfortable with coalitions and compromise than declarations and demands. His speech pattern is that of a person who is always searching for the most precise way to communicate his ideas. While these traits may limit him as a debater, they are quite refreshing in our age of unflinching partisanship. After a very entertaining vice presidential debate last week between Joe Biden and Paul Ryan, the stage is set for a spirited town hall-style debate between President Obama and Governor Romney on Tuesday night at Hofstra University on New York’s Long Island. Voters in the audience will be asking questions of the candidates, moderated by CNN’s Candy Crowley. Four years ago, Barack Obama spoke of the “fierce urgency of now.” His campaign was fueled by the notion that we cannot and should not wait another moment for an effective and responsive government. Both candidates need to embrace this sense of urgency if they want to successfully persuade the electorate that they should be the next president. These are desperate times for millions of people – for those unemployed, under-employed and in otherwise difficult economic straits. There is a palpable unease for millions of others. The public wants and needs to know that the president shares their urgency. As they prepare for their next debate, Obama and Romney should keep in mind Oscar Wilde's poignant assessment that “behind the perfection of a man’s style, must lie the passion of a man’s soul.” The ability to deliver a passionate and heartfelt defense of the American Dream will do more to win the presidency than cramming policy briefs or memorizing witty retorts. Ed Lee is the director of debate at Emory University in Atlanta, one of the top debate schools in the country. He has coached debate there since 2004 and won numerous awards for his work.